Using Firebug, you can test which file of your web page is causing the delayed loading of the page. 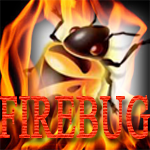 We have to open Firebug > Console and then click Profile. You need to reload the page you are testing. Then click Profile again and you will find a report in the console.